Have you considered Twinlight Laser Skin Resurfacing for your face and neck wrinkles or even acne? Hundreds of people all over south-east Queensland have tried our laser resurfacing Brisbane treatment and keep coming back year after year due to the skin rejuvenation benefits. Ageing is a fact of life, and everyone’s skin responds differently to the natural aging process. As time goes on, some people notice sagging skin, often around the jawline or eyebrows. Some people notice their eyes starting to look hollow, or they notice the pigmentation on their face getting darker. Some people develop more and deeper wrinkles, while others want to get rid of troublesome acne. However, while you can’t stop an extra candle being added to your birthday cake every year, you can turn back the clock for your skin! Advancements in laser skin resurfacing and tightening means you can repair the damage done to your skin as a result of the sun exposure and time by harnessing the skin’s natural repair mechanisms. TwinLight® Fractional Laser Skin Resurfacing treatment is About Face Brisbane’s secret weapon in the fight against aging skin. This cutting-edge treatment is the latest five-step laser procedure to renew your skin, bring back its natural beauty and make you look years younger. Whether you have mild, moderate or severe skin damage or are just looking for aging prevention or skin maintenance, you will love the results. 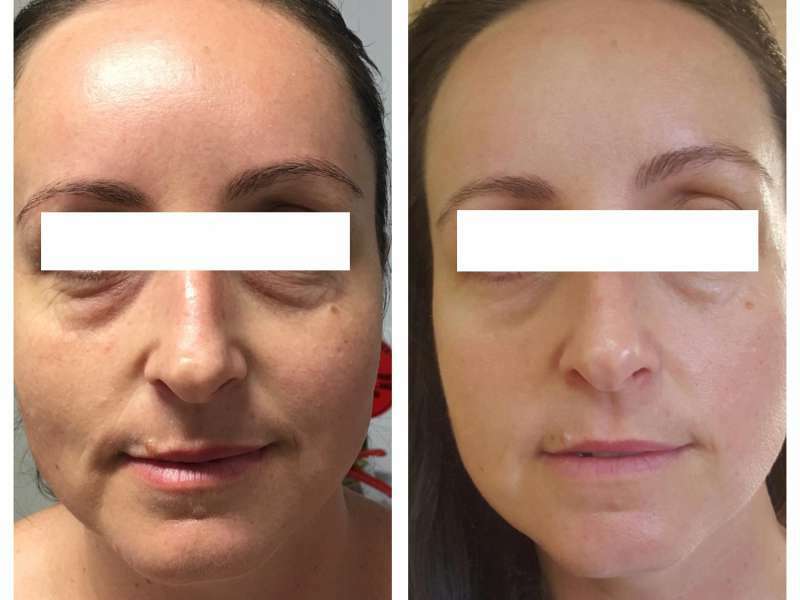 What is the TwinLight Fractional Laser Resurfacing Brisbane treatment? The TwinLight® is a 5-step advanced Fractional Laser Skin Resurfacing procedure that can be tailored to each individual’s skin concerns. The laser was developed by Fotona in Slovenia, Europe, and allows us to use two different types of laser technology, called Nd-YAG and Er-YAG. TwinLight Laser Skin Resurfacing treatment is the gold standard when it comes to laser skin rejuvenation. What are the benefits of TwinLight laser Skin treatments? Apart from these benefits, one of the key factors that makes our TwinLight treatment the gold standard in laser skin resurfacing and skin rejuvenation is that the laser beam precisely targets skin imperfections only, leaving the healthy skin unaffected. Production of new dermal (skin) protein is stimulated by the heat generated by the laser beam’s energy, and this rejuvenation process is sped up by leaving the surrounding, unaffected skin intact. This means you’ll see great results even sooner. Full face rejuvenation and improved skin texture and colour. What are the steps to our laser Skin resurfacing treatments? The TwinLight laser combines two types of advanced laser technology, called Nd-YAG and Er-YAG. The deep heating generated by the laser’s Nd-YAG mode stimulates collagen to increase facial volume and Er-YAG mode helps maximise superficial tightening. There are five steps involved in a TwinLight fractional laser skin treatment. Each step is explained in detail below. The Nd-YAG in FRAC3 mode is used on the skin to create gentle heating effect. This heating stimulates the skin’s capacity to naturally rejuvenate by causing micro-wounds in damaged or prematurely aged skin. Using the Nd-YAG in PIANO mode, (the longest and deepest pulse) bulk heating occurs to stimulate skin tightening. Aged and sun-damaged epidermis are ablated by the laser’s Er-YAG fractional mode. The precisely ablated micro-channels are then replaced with fresh, healthier and tighter skin. This step is tailored to the individual needs of each client. It may involve treating the under-eye area, or focusing more on lines and wrinkles around the mouth, or the removal of lumps and bumps. The treated skin is lastly ablated (gently) by an Er-YAG ablative beam. This completes the treatment by removing superficial imperfections with a light peel. Unlike other laser treatments, the fractional laser resurfacing treatment precisely targets thousands of microscopic areas by using a pinpoint laser beam that penetrates deep into the skin where the damage first started. The treatment stimulates your body’s healing process and replaces the damaged skin with new healthy skin. The unique technology targets only damaged skin cells and leaves healthy skin cells intact, which will further stimulate the healing process. This means much less downtime compared to other facial resurfacing treatments. What should I expect before, during and after my laser resurfacing treatment? If you’re interested in a TwinLight® 5-step advanced Fractional Laser Skin Resurfacing treatment, you’ll first have a consultation with Dr. Colin Campey, who will then refer you to About Face’s qualified and experienced laser and skin technician, Karen. Karen is passionate about TwinLight laser skin resurfacing procedures and will be able to answer any questions you have. It’s important for Karen to know exactly what skin care products you are using at home, to make sure they won’t react with the laser treatment, so please bring a list of the names of the products you are using along to the consultation. Karen may also need to know if you are taking certain types of prescription medication, as your safety is very important to About Face, and in rare cases, some medications can affect the laser treatment. This includes doxycycline, a form of antibiotic used for many skin conditions, which can make you more sensitive to the sun and light. During this consultation and prior to treatment Karen will discuss the treatment steps and how they work and will provide advice on your likely recovery period. A topical numbing cream is applied to your face and after it takes effect the treatment will begin. During your TwinLight laser treatment, you’ll lie in a comfortable position on a treatment table in a QLD radiation health certified room. The treatment will take between 40 to 50 minutes. Karen will further explain each step in depth as she is treating you. A gentle treatment gives a light rejuvenation which will heal faster meaning you could have it on a Saturday and return to work Monday. The heavier intensity (which works wonderfully for reducing lines and wrinkles and improving skin tightness and volume) will require anywhere from 2 to 5 days of recovery. Once the initial healing is complete, the surface of your treated skin will look brighter with a more even skin tone and feel softer to touch. Progressive results occur over the next three to six months, as the deeper layers of the skin continue to heal and regrowth of collagen occurs. You will need to come back and see Karen 12 weeks after the treatment. At this appointment, Karen will do an assessment and give you a little more treatment where she thinks you may benefit (free of charge). What are the after-care requirements? After your treatment, you will take home a healing cream and a post-treatment form full of important instructions to follow. Karen will give you a phone number that you can call at any time after your treatment to discuss any concerns you may have. It is extremely important that you follow the post-treatment recommendations provided to you. Avoiding sun exposure is of high importance to prevent irritation to your treated skin. We live in a harsh environment and we know it’s important to use a zinc sunblock that provides a barrier to protect your skin from further sun damage. Once your skin has healed, we recommend using chemical-free, superior quality Synergie Skin Care products to maintain your refreshed appearance. Visit our Synergie Skin Care page for information on the Synergie products we stock and how they will benefit your skin. How many TwinLight treatments will I need? This depends on a couple of things. Firstly, the skin conditions being treated will affect the number of sessions required. If there are only superficial pigmentation and minimal aging you may need only one session. If you have very loose or sagging skin and severe sun damage present then you may require further treatments. The second factor which will affect how many treatments you need is your skin and lifestyle needs. The treatment can be tailored to be more intense, or less intense, depending on how much downtime you are comfortable with. Karen will be able to give you an indication of how many sessions you’ll need when you have your initial consultation. Some patients have only needed one treatment, while others have needed two or three. An annual TwinLight treatment is a great way to delay further aging and sun damage. How often can I have TwinLight treatments? Treatments can be repeated once every four to six weeks until the desired result is achieved. Topical numbing cream is applied before the treatment commences. As a result, there is only minimal discomfort involved. However, as with any laser procedure, the long-term anti-aging benefits always far outweigh any short-term mild discomfort. How is TwinLight better than microdermabrasion or chemical peels? Microdermabrasion and chemical peels do not offer the same level of accuracy and control over treatment when compared with TwinLight. As TwinLight fractional resurfacing only treats damaged skin cells and leaves healthy cells intact, your skin will recover much faster from a TwinLight procedure. I’m not ready to try laser resurfacing treatments yet – what else can I do to improve my skin? Fractional laser skin resurfacing and laser skin rejuvenation treatments are extremely common procedures these days, and its popularity is due to the fantastic results it delivers along with fast skin recovery post-treatment. However, it’s understandable for some people to be a little hesitant at first when it comes to lasers, especially if they’ve never had any type of laser treatment before and aren’t sure what to expect. We’ve all heard the horror stories about people being burned or scarred by untrained, inexperienced ‘beauty therapists’ using inferior machines. At About Face Brisbane, TwinLight laser treatments are performed by Karen Campey, a highly qualified and experienced laser technician. With a degree in Health Science specialising in Aesthetics, Karen’s passion is for performing TwinLight fractional laser skin resurfacing treatments, and she knows exactly how to safely achieve excellent results for her patients. Karen’s patients have never experienced any burning or scarring. This is due to her expertise, training, and through using only a superior laser machine. Fotona, the manufacturer of About Face Brisbane’s TwinLight laser resurfacing machine, is the world leader when it comes to medical lasers. Karen has treated male and female clients ranging in age from 20 to 80. With About Face, you can relax, your skin is in safe hands. However, if you’re looking for a non-laser skin rejuvenation treatment, our HydraFacial treatment is an excellent option with no downtime involved and instant results after a quick 30-minute treatment in our laser skin clinic. You may also be interested in dermal fillers to replace or gain volume in your face. We also recommend you treat your skin at home with the daily use of Synergie Skin Care products, which contain no nasty or toxic chemicals, such as parabens and petroleum-based chemicals, which are commonly found in supermarket skincare brands. Led by Dr Colin Campey and Karen Campey, our team has over 80 collective years of therapeutic/medical experience. We use the latest technologies and have performed over 15,000 procedures using our advanced techniques. With our industry experience and friendly staff, you're in great hands. Medicare rebates available on our medical treatments. Copyright © About Face Brisbane 2017. All rights reserved.